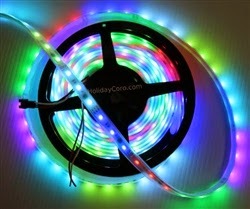 HolidayCoro.com RGB Lights Blog: Where Do I Start When Designing a New RGB Pixel Project for My Holiday Display? Where Do I Start When Designing a New RGB Pixel Project for My Holiday Display? HolidayCoro receives a large number of questions each year from people that just don't know exactly where to start with the design of an RGB element (House Outline, MegaTree, arches, etc) and we can completely understand how overwhelming the process can be when just starting out. After working with so many customers, we have come to see a fairly standard process emerge that can bring most customers through from "How do I" to "I did it!". Please note that due to the complexity involved with each project, this article, as detailed as it is, does not contain 100% of the technical information needed for your project. Please consult with your vendor for application specific advice. Here is a broad overview of how that process works and listed below is a more detailed breakdown of each major task and what you should consider at each decision point. While there are some elements that lend themselves to full plug-n-play solutions, such as MegaTrees, other elements such as a house outline are 100% custom and since each house and design requirement is unique, it is almost a sure thing that you'll need to customize the hardware you purchase to meet your specific needs and this most often means - soldering and building items yourself. So, consider this factor when picking the project you want to build. To those that are worried about soldering - we have many of our own videos on the subject and YouTube is also filled with thousands more on the general process of soldering and we are almost sure that once your try it out, it won't be as hard as you though. 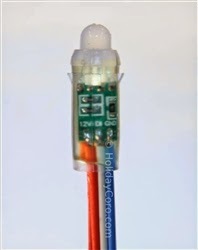 HolidayCoro also offers a number of products with strip and nodes (see below for what these are) that feature pre-soldered and attached waterproof connections. A Smart RGB pixel is a single light or a small group of lights (each themselves comprised of an Red, Green and Blue light), usually never more than 4 total lights, that are individually controlled much like a "pixel" in your computer screen. That pixel can be any color (hundreds to millions) and can be directly controlled separate of the other pixels. What a pixel is NOT is a full string of lights that all turn the same color, even if they are RGB, at the same time. Pixels are ALWAYS individually controlled (within a small grouping of lights). There is no such item as a "Dumb Pixel", all pixels are "Smart". You are talking only about "smart" or "intelligent" pixels but what about dumb RGB? A number of years ago, before the advent of super-cheap pixels and the availability of high pixel count controllers (E1.31 controllers), dumb was a reasonable direction to consider over smart pixels. Fast forward to 2016, with prices for smart pixels and controllers generally running 20-30% more over dumb, it now makes little sense to go with dumb on most larger elements (house outlines, MegaTrees, arches) over smart pixels. That said, there are still places dumb RGB makes sense but that area is growing smaller everyday. What voltage should I use for my RGB lights? The two most common RGB light voltages are 5v and 12v DC. See our Knowledge Base article about the pro's and con's of using each voltage type and some common rules of tumb for each type of project and light type. What pixel controller do I need for my project? It is common for people to be concerned about controller selection early on in a project and what we find is - it just doesn't matter. We say that you don't pick a controller, the controller picks you and that is because when you've properly defined your project as to design, power and pixel count, the possible choices of pixel controllers is usually pretty narrow and obvious. I don't know anything about DMX - is this going to be hard? A DMX Universe has up to 512 channels (or 170 pixels, each with 3 DMX channels). A controller simply has a DMX start address for something (such as pixels) hooked up to it, so if you have a 24 channel controller and you set the controller up as DMX channel 1 in universe 1, the controller will use DMX channels 1-24. Can I hook up (daisy chain) E1.31 (AlphaPix controllers) with my LOR Controllers? No - E1.31 (DMX over Ethernet) is a completely different signalling system than LOR controllers which use an older technology called RS-485 - not Ethernet which is used in E1.31. To split the signal to multiple E1.31 controllers, use a cheap network switch. For a complete list of all possible inter-operational solutions with LOR and DMX networks, see our Knowledge Base. It can be a bit overwhelming to see YouTube videos of amazing RGB displays and think - how do I get there? Well, it starts with narrowing your choice to a single project or "element". While it is important to think of the overall display design, such as where you might put arches, or a singing character or a MegaTree, once you decide on a given element, then you need to narrow your project to just that element. Most often controllers, power and other factors are centralized to that specific element and thus stand alone from other elements in the display, so, building one element at a time most often makes the most sense. Can be extremely simple if purchased as a complete package that is plug-n-play (up to including pre-sequenced songs) or moderately complex if completely custom. The most complex part is often the mounting system for the lights and sequencing, not the lights and controllers. Picking a single project will allow you to focus and get a win and make future RGB based projects much easier. What areas of the house should you outline? 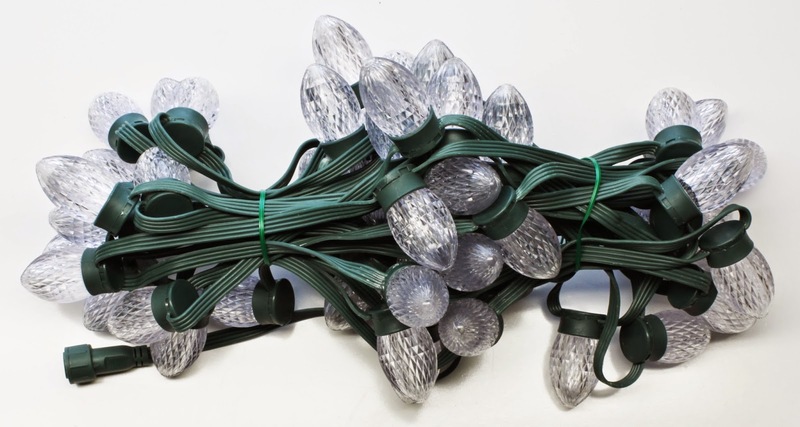 What type of lights do you want to use - strip / ribbon or bulbs? Where is the tree going to be located? On the corner out by itself? In the middle of the yard? How large do you want it to be? Will it overwhelm the other parts of the display? What type of lights do you want to use - strip / ribbon or nodes? Without a clear idea of the design, it is nearly impossible to properly determine what should come in the next steps. Note that while there are some common questions listed above that you should be asking yourself, there are always many more that are specific your location, budget and even motivation. Also note that at this point it can be hard to determine the cost of an element until the entire process is completed, so you may need to go through the entire process of design and specification, then return back to either scale up or down a project based on cost. This type of pixel is native to the sign industry in Asia. As where in the US we install LED lights in a channel letter sign and face the sign with acrylic, in Asia they often will use sheet metal instead of acrylic and fill this area with 12mm holes in which these nodes are mounted. The holiday light community has adopted these nodes for their own uses outside of being mounted into a sign blank. Common traits include: A "neck" that is designed to fit into a ~12mm hole in ~1/32" thick sheet metal. Common traits include: Flexible (also available in a rigid format but that is uncommon in holiday lighting since we mount it to a substrate), usually sold in meter long lengths coiled into "rolls". Waterproof and non-waterproof "boots" - generally you can ignore "IP" ratings as they are often fake or misleading. LEDs per Meter (LEDs/m) - For a given one meter (39 inches) length of strip, this says how many LEDs it contains. 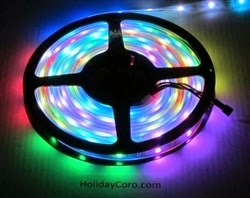 For RGB strip, that LED is 5mm by 5mm in size, (most often called 5050's) each one which contains all three (RGB) LEDs. So, 30 LED/m strip will contain thirty, 5050 LEDs, each which contains three individual color LEDS. Technically, this would mean that a 1 meter length section of 30LED/m would contain 90 individual LED lights. ICs per Meter - This defines how many IC's or integrated circuits are located in a single meter of strip. A much easier way to think of this is "Pixels per Meter" instead since what it really means is how many, individual lights or small groupings of lights can be individually controlled. A common strip might have "10 ICs/m", so this means that in the 1 meter length there are 10 "sections" or pixels that can be controlled. When the number of IC's is divided into the number of LEDs per meter, you know how many individual lights make up a group, if any. For 30/10 strip, this would mean that over the 30 LEDs in that meter, every 3 LEDs makes up one "pixel". When the LEDs and the ICs become the same number, such as 30/30 or 60/60, that means that each LED is directly controlled, not a group of LEDs. Voltage - For strip, the absolute most common voltage is 12 volts. It just works too well not to recommend it for the small price difference over 5 volts. When you should be using 5 volt strip, you'll know. Pixel strips come in a huge variety, the most common being 30/10 but also 30/30, 48/16, 60/20,60/60 and others. Always purchase strip in a silicon "boot", we recommend without "injection" for easier soldering and repairs. Strips with "silicon injection" are not necessarily stronger. You might noticed that often 12v strips will come with 3 LEDs per pixel and there is a good reason for this - it allows the power to be run in series instead of parallel, improving the power efficiency of the strip. Strips with 30/30 or 60/60 often have to have "buck" converters to reduce the voltage from 12v to 5v throughout the strip to accomplish the same thing and as a result, are more expensive - they also have limits on where they can be cut. Common traits include: Many different types of RGB LEDS (5mm, 12mm, 5050, etc) mounted in a self contained housing of either plastic or metal. Modules are often variations of strip or modules. 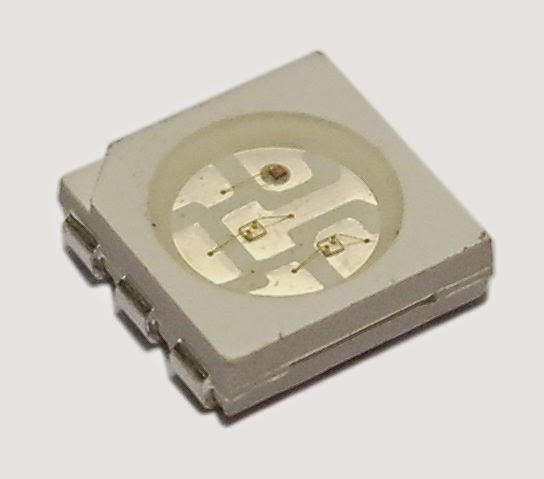 For example, a rectangle pixel module (see below) often is just a single pixel with the same type of LEDs (5050) and the same format of 3 LEDs but instead of being in a flexible strip, are instead mounted into a rigid housing with wire connecting the modules together. Common traits include: A diffused cover of either milky or clear plastic is placed over a variety of LED types (8mm and 5050's are common). These are designed to mimic the look of "traditional" C7 or C7 bulbs. Typically come with wire separating each pixel of a few inches to a foot. As these bulbs are not "normal" C7 or C9 bulbs, mounting them can be fairly different than typically done with standard "legacy" bulbs. If you've never seen these types of lights, you might want order a sample kit that contains a few of each type of pixel. The process of determining how you mount the selected light is sometimes a process of refinement. You may need to select a light type (from above) but also at the same time consider how that light will be mounted. Nearly all pixel types need to be mounted to some sort of substrate or mounting system. That can be many types of items, from PVC pipe, EMT pipe, rope, banding, custom mounting adapters, steel, plastic sheet, coro and many others. Why do pixels require this mounting? Several reasons - the first is that pixels are a bit more fragile than traditional lights and the second is that pixels, in most cases, need to be very accurately aligned and spaced to ensure a consistent appearance. Remember, each of these lights (or group of lights) is directly referenced in "space" within your sequencing application and thus they need to be in a predictable location and pattern. An important factor to consider when selecting a mounting location is one thing - your viewer and audience. If your display is viewed from the road, stand in the road at the same height a typical viewer would see your display. If your display has lots of foot traffic, look at the display from all the possible angles your viewer would be at. Placing elements or lights that overlap one another or are only partially visible will distract from the overall effectiveness of your display (e.g. - MegaTree in front of a house outline). A general rule of thumb is to place larger items to the back of the display (megatrees) and smaller items towards the front (arches, mini-trees). Make sure that all outlines can be seen from the normal viewing point of your audience. 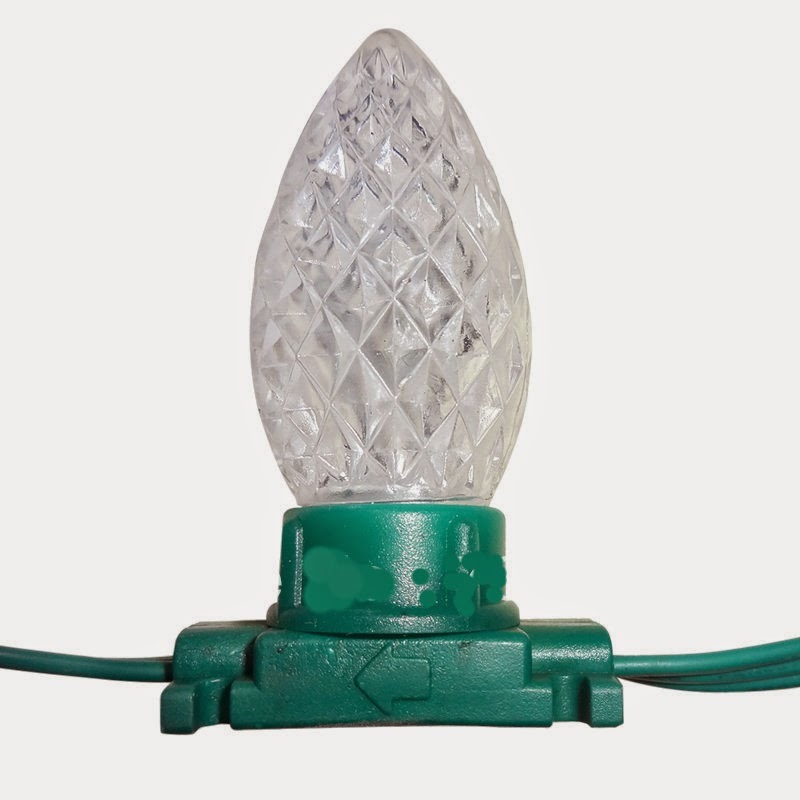 Considering mounting methods that allow easy installation and removal like the HolidayCoro PVC pipe clip. On front of fascia - Consider issues such as snow or ice obstruction, daytime "look" and if the mounting system will be left up year round, consider how that will look when the lights are removed leaving the mounting hooks / clips / etc. Under fascia or soffit - A preferred mounting location when used with year-round installations. Be aware of the reflection of light off the wall and soffit as this can create undesired "wall washing". Roof Line - Make that your audience can actually see the entire roof line. The first major factor in a MegaTree to consider is the viewing angle and how many degrees your MegaTree needs to be to be fully visible (assuming this is what you want) at all time. A typical tree will be 180 degrees since all pixels will be pointing away from the center of the tree and most trees because of their size are located at the back of a display, it doesn't make sense to have lights on the back of the tree. A RGB Pixel MegaTree is just a large rectangle matrix of pixels, instead just wrapped in a cone. As such, you need to mount these pixels consistently with vertical and horizontal spacing. Pixels can't just be left "dangling" without support or directional assistance. The two most common pixel types are strip and nodes. Strip - Usually limited to 16 ft and is most often supported with EMT or PVC pipe and using zip ties or velcro to attach the strip to the pipe. Rarely used in 20 ft + MegaTrees. Nodes - Sizes can be 40 feet + usually without issue. Products like our PixNode Strip(tm) can be used for mounting pixels. Also consider how the node mounting system will work with your support system. You may wish to check out the HolidayCoro QuickTree(tm) Pixel MegaTree mounting system. Rebar (usually 24" to 36" long) put into the ground at an angle and the PVC pipe slid over the top of the rebar. Some people will use diffusers of plastic or other materials to create a more blended color output also but this is not required. An important part is to think through the entire life cycle when designing your mounting system - consider not only the cost and time to build but also how hard it will be to install, repair if needed and remove from your display. Also consider storage in the off season. At this point you should now know what type of light and how you will be mounting that light but a still more important decision - how many of those lights, needs to be determined. There are some pretty logical factors to consider when selecting your lights, so let's start with an analogy of two other items that use pixels in your daily life and how they can be used to help determine how many lights we might need. Both the TV in your home and the monitor on your computer, laptop, tablet or phone have one purpose - to convey information to you through a grid of individually controlled RGB pixels and there are some very close associations between those devices and a pixel based element for a holiday display. Try this - go up to your 55"+ flat screen TV and look closely, at about 2 feet or so from the TV and you'll likely be able to make out the individual pixels and the resulting picture is coarse and grainy but if you stand back to a more normal viewing distance of say 15 feet, you just see a nice smooth picture without a hint of the coarseness. Now go up to your computer monitor and from the same two foot distance, look for the pixels. With any modern monitor you won't see the pixels, just like you can't see the pixels on your 55" flat screen from 15 feet away. Each monitor might have the same number of pixels but what matters is the density (screen size in this case) of those pixels in relationship to the viewing distance. More pixels doesn't equal better quality at certain distances - For example, a common mistake is that people will want to use 60/60 strip to outline a house with a viewing distance of 150 feet or more. At that distance it just isn't possible for normal people to see the individual pixels. More pixels is just more channels - For every pixel you add, it adds three additional channels. While that might not sound bad, going from a common 30/10 strip to a 60/60 strip on a house outline will result in five time more channels. Those channels then add up to more work for the sequencing application to process, more network data, larger sequence files with larger file sizes and even if you surpass the limits on your controllers channel count - more controllers and all for what? Nothing that the viewer could see as a difference. More pixels, is more lights, is more power - As you add more pixels, normally you are a adding more lights also for each pixel and this of course increases the overall amount of power. Increasing light counts increases all kinds of issues - larger gauge wires, more power injection points, more power supplies, more housings and often, more controllers and more money. Again, unless the viewer could actually make use of those pixels, it was all for nothing. On a side note - yes, there could be cases where you want a very high level of light output and putting greater density is one way to do that but keep in mind that the way the human eye sees light isn't linear - so doubling the number of lights won't anywhere near double the light a person "sees". This is the same phenomenon where you can see a red stop light at 12 midnight nearly as well as you can during the brightest part of the day - your eye and brain moderate the amount of light you "see". Color mixing - Let's use an example of two pixel strips, both viewed from a distance of 75 feet, a common viewing distance for holiday displays. One strip is 30/10 which means there is one pixel with three LEDs every 4 inches. The other strip is 60/60 which means that there is one pixel every .65 inch. Let's then turn on each alternating pixel to red, green, red, green and so on. When viewed on the 30/10 strip at the 75 foot distance, you are going to see the individual pixels, each 4" long and each pixel will be a distinct color with very little color mixing - it will look like what you expected when you sequenced it. Now if we view the 60/60 strip, with their .65" spaced pixels, you likely aren't going to get clean red and green alternating colors but instead you are going to get a muted mix of colors mostly as a yellow color. What happened here? The strip itself was red, green, etc but since the pixels were so close and the viewer so far away, the colors started to mix when seen by the viewer. So, as you can see, more isn't always better and can even result in negative results. The take-away here is that you should select a pixel and pixel density that is relevant to your display. Keep in mind that some pixel format's pixel density can be adjusted, such as bulbs or nodes but others density is completely fixed, such as with strip. We are entering the final stretch and we'll need to take off our design hat and put on our math hat so we can determine how many pixels we will end up with and how much power it will take to run all those pixels. First you need to start with pixel counts. Minimum Spacing - This is the closest two pixels can be installed, For a "bullet" pixel node it might be about 1.5 inches from center to center. For other pixels there is no adjustment possible, such as with pixel strip which is fixed in spacing. Maximum Spacing - This is the furthest distance two pixels can be installed apart and the usual limit is based on the length of the wire. Be careful about "spacing" or "wire" lengths listed by vendors, for example, a pixel node might be listed as 3" spacing but when installed, only have 2.5" spacing. Make sure to confirm center to center spacing, not just the distance of the wire that was used to assemble the pixels. Again, some pixels such as strip are fixed in spacing. Maximum Gaps - Keep in mind that with pixels, there is a limit to the distance that can be spanned between them or from the controller to the first pixel. This limit varies based on a large number of factors but a "safe" number is usually 15 feet with 20 feet often being possible. If you need to go longer between pixels, you'll need to setup "null" or "ghost" pixels that serve only one purpose - to repeat the data from one pixel to another but are not intended to be used for light output. We would recommend using a spreadsheet to perform your calculations, such as the one available in the House Outline blog post or one of your own design. Along with pixel count calculations, it can also be useful for keeping track of channels and assignments to those channels. Accuracy of the posted pixel vendor specifications - Even a difference of a new milliamps of power when multiplied over a few thousand pixels can add up to large differences. Please note that Chinese specs on items purchased directly out of China are notoriously incorrect. Accuracy of the actual item purchase - It is extremely common for wire gauges to be labelled incorrectly, even down to what is printed on your wire. That "18 AWG" pixel wire is more likely to actually be 20 or even 22 AWG. This affects the overall current carrying capacity of the wire. Wire type - Wire in the actual cables can be anything from copper clad aluminium, to copper clad tin to 100% copper and each type of wire has different current carrying capacities. Wire distances - The overall distances of the wire used will affect the current carrying capacity. Where possible, always use the shortest possible wire between pixels. Temperature - Current carrying capacity is affected by the temperature of the wire. Additionally, as pixels increase in temperature when they are running, resistance increases. Voltage - As voltage goes up, the amount of wattage for the same given cable size will increase. Of course this is a double edge sword - this results in pre-mature damage to the pixels and additional waste heat. HD Strip - If you are using strip/ribbon, there are Standard (most common) and Heavy Duty strips, check with your vendor for the maximum length of strip before power injection is required. Of course to determine total wattage, you just multiply the watts per pixel, so a 50 count pixel string with 30mA pixels would be 18 Watts or 1.5 amps @ 12 volts. Gather all this information and put it into your spreadsheet along with the pixel counts. We've arrived at the point that ironicly most people are worried about which often is one of the easier parts (considering the complexity of power calculations) - picking the pixel controller or controllers needed to operate all your pixels. 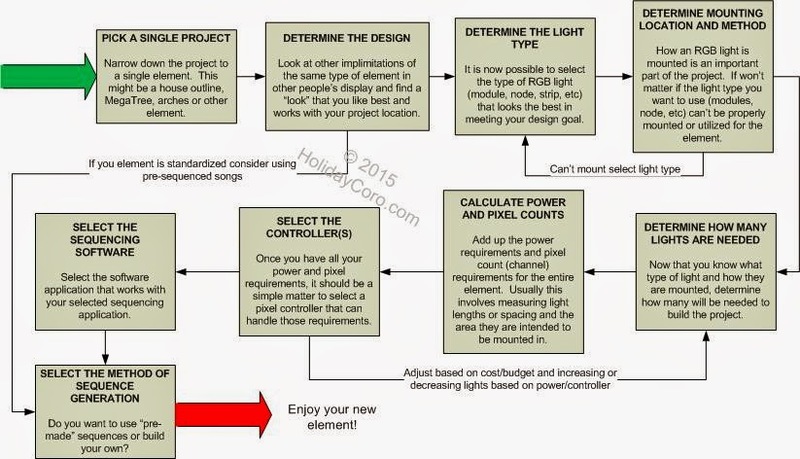 So, this explains why it only partially matters what the output current of your controller is as there is a limit to how much power could even be supplied from the controller to the furthest lights on long strings of lights. Power per Output - Each controller is going to have a rated amount for how much current can be output over a single connection. Do NOT go by fuse value as the fuse isn't there to "limit" the current, it is there to prevent a short of wiring. In fact, it is highly likely that you could hook up many more amps of lights than the rated output and the fuse will still not blow as a result of the resistance from the wire and lights themselves. When in doubt - pull out a meter and measure it - you might be surprised. Power per Bank - In a 16 output pixel controller it is common that the controller will be broken, from a power standpoint, into two banks and that those banks are often around 24-30 amps. There is a good reason for this - this also happens to be the standard amount of power of a 350 Watt power supply (12v @ 29 amps). If all the lights connected to both banks are less than the total amount of power supplied by the power supply, a single power supply can then supply both banks of power, otherwise you may need to break the power into two banks with two separate power supplies. Power per Controller - This is the total power for both banks combined. Pixels per Output / Controller - Controllers have varying different limits of pixels they can control. Those limits are along a single output, such as 170 pixels or 680 pixels per physical output. So, when you are laying out which strings or runs of pixels need to be connected to a given output on the controller, be aware of power but also be aware of the need to limit the pixel count if the controller isn't able to handle it - or upgrade to a controller that can handle your needed pixel count. Most other features are going to be pretty common on most pixel controllers, things like protocol support, null pixels and channel configuration. 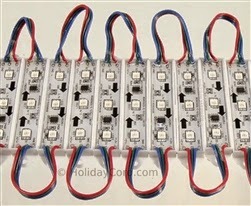 You can find HolidayCoro Pixel controllers here. With Nutcracker123 (complicated but free) Well supported Advanced version must be used for use with DMX Controllers. Most common and well supported sequencing application. Can be complicated to setup. LOR generally refuses to support or troubleshoot with 3rd party hardware. Free trial Very High High to Very High depending on your skills Yes, built into the product Poor support Often requires work arounds. Very functional app but requires a lot of time to get up to speed. Hinkle's Light Sequencing Application Free Moderate Moderate Varies / Depends on Forum and source. See DIYC Forum. Since most paid vendors have trial editions, this allows you to tinker with the applications and determine if it feels right to you. A big part of selecting a sequencing application will depend on what you are using now, where you like to get your support (phone, forum, Facebook, etc.) and of course your budget. Each sequence will reflect your ability, good or bad on how YOU want your display to feel. You won't have to hunt down sequences or pay for sequences (typically high pixel count sequences run in the $20 to $40 range). The sequence will be 100% customized to your display and won't need to be "tweaked" to fit your display elements. Sequencing can take from hours per minute of music (high quality, hand sequenced) to an hour per song (lower quality, generic, computer sequenced). You'll need to learn how to use "self sequencing" applications like LightShow Pro, Xlights Nutcracker or SuperStar lights.) Depending on your skill , this can take hours to days. If your element (Megatrees are the most common) matches up perfectly to the pixel count in the sequence, it can be truly plug-n-play. Allows you to use high quality hand-sequenced songs from others with more skill in this area. Vendors should be able to help you with loading and minor customization of your sequence as part of the cost of the sequence purchase. If your element, in particular house outlines, doesn't "match up" to the sequence from the vendor, it can be a lot of work to adjust it to match the channel count and design of your display. It costs more in initial outlay. Of course this doesn't factor in if you place a cost on your time. The major issue today with pixels is that baring a few element types like MegaTrees, there is just about zero standardization. So, if you purchase a pre-sequenced song for someone that has a house outline with 500 pixels and your house has 800 pixel on an outline, it can be fairly complicated (depending on the application) to adapt it over to meet your specific needs. The problem today is that there isn't really a perfect application out there. Even when I started with pixels back in 2010 I could see that the software would always be a problem (see the Death of the Grid article). I must say that while people have made strides in minor improvements and add-ons, we've yet to see the big money project to make a truly well designed sequencing application. But, that said, don't let this sway you, even with the tools today it is possible to make some really amazing displays. While we've tried to boil down the process of designing a pixel based element to as few elements as possible, the process can be a bit daunting for some. Don't worry - start with a single project and we are sure, like nearly all our customers, that you'll be able to be doing better and better projects before you know it! Have a great season from HolidayCoro.com! If you have any feedback or corrections, please feel free to leave them below. If you have questions, please direct them to our website feedback page for the quickest answer. If I'm using a centralized LOR 16-ch controller, and I place it in the middle of the house, then connect the house outline smart pixel strips from there, I know I'll need to infuse power along the way, but will the Cat5 signal be good from the controller to the ends of all the strips? When injecting power down the line, does it matter whether I do it at the beginning of the next section of nodes or at the end? For example, I have 340 pixel nodes, I hookup the power supply to the beginning, then do I have to inject half way, or can I simply run the power wires to the end of the entire string of nodes and have the same results? For 340 pixel nodes running at 12 volts (I guessed here), which each use .55 watts, you are using a total of 187 watts so this single run would require power injection. You would need to hookup power injection at a minimum at node 120, 240 and 340 or more often if the design allows (matrix panels are a good example). With that many pixels, how many channels/universes would I need? how many outputs from my centralized controller would it take? There are 512 DMX channels per universe, so 512 divided by 3 is 170 so this indicates that there are 170 pixel per universe possible. So 340 pixels (not channels) is 2 universes. How many outputs would be required depends on how many universes can be controlled from a single output on the controller and that is a controller-by-controller case. I will say that in many designs, that many pixels on a single output isn't common, mainly because there are other technical limitations such as power, distance and wiring, so having 340 pixels on a single output would typically be associated with very tight formations of pixels, mainly on a pixel matrix. Looking to start building on Christmas 2017 but wondering about how much computer I need to run the show. Pretty much any PC made today is going to be powerful enough to output data to run your show. The reason why you'd want a faster computer would be the sequencing - a faster computer makes it quicker to perform sequencing. 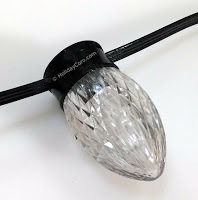 I just bought the 8 inch brilliant bulbs and I was cutting and soldering to the length that I need and they now flash when they are on white lights why is that and how can I fix it? Contact HolidayCoro at http://www.holidaycoro.com/contactus and we can provide you either repair instructions or process a replacement. This article is so informative! My question that I didn’t see answered here, if I have multiple elements (say a mega tree and arches) do the controllers allow me to run an Ethernet out to the next controller? Basically Can I daisychain my Ethernet or do I need to run a new Ethernet cable from a switch to each controller element? 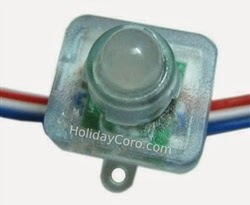 In the description of the 12v / 50 node / bullet pixels (http://www.holidaycoro.com/12mm-Pixel-Node-With-Waterproof-Connections-p/711-wp.htm), it says that up to 100 pixels can be powered without power injection, and that each string takes 27W. - Each output of my AlphaPix16 can only power 2 strings, then power injection is needed if I want to daisychain more strings. - Based on my AlphaPix16 having a 350W supply, I can power a total of 12 strings before needing an additional power supply. Can you describe how these other power supplies get added to design? Where do they go? Do you just lay them on top of your roof and hope they don't blow off? No, the alphaPix can power up to 60 watts at 12 volts, so it can actually run about 200 pixels, the limit isn't the alphapix, it is the pixels - they need power injection to make the power go that far. For details on exactly how many pixels at what voltages and with and without power, check the product page for the controllers and there will be a table that lists all the maximums. Due to the complexity of power management, with power at the controller to multiple banks and with power injection either with a single or multiple power supplies, it is not reasonably possible to answer this question here - contact us about your specific project. You say the limit is 5 amps per string on most controllers is this just for amps injected by the controller? Does power injection eliminate this limitation? The typical 5 amp limit is for power passing though the controller and out the output plug. This does not apply to any power injection design. so a string can be 30 amps on a 5 amp controller as long as I inject often enough. Sorry if I'm being redundant.